Restoration Hardware is one of my go-to resources for beautiful bathroom lighting. Their catalog showcases a wide array of design styles from classic to fantastical. The Sutton Grand Sconce is a perfect choice for an elegant, hotel inspired bathroom, where space is at a premium. At only 5” wide, this tube-like sconce will fit neatly where more traditional larger sconces will not and at 30” tall it will provide even lighting as well. The Nolan Double Sconce, also from Resto, is a simple, pretty fixture that looks nice when lit and un-lit. A great choice to place between a pair of mirrors over a double vanity when space may be at a premium, this fixture will provide even light for both mirrors. Likewise, this fixture will work well in pairs or in threes in an oversized space. I love the Wilshire Single Sconce from Restoration Hardware for its classic elegant simplicity. This is a real “go-to” piece that comes in satin nickel, oil-rubbed bronze and polished chrome. It could be used to flank a vanity mirror, or to illuminate a large soaking tub space. The Olympia Bath Strip by Kichler is a modern and more attractive version of the old-school makeup lights. The 4-light fixture is only 7” tall, which will fit perfectly above most vanity mirrors or medicine cabinets and provide soft white light Opal glass diffusers. The Robern “M” Series Wall Mirror lights are sleekly modern fixtures that affix to the back of wall-mounted mirrors for a subtle look that packs a punch. The halogen fixture produces a bright white light. For those who love a more “shabby chic” look, the Old World Designer Chic light available through Lamps Plus, is perfect. While fairly small at just 5-3/4” wide, the crystal drops and cream distressed finished are just the right mix of worn and sparkly that is so popular right now. I saw the Decayed Silver and Glass Blossom Chandelier from Porta Romana at this year’s Kips Bay Show House and I can say, it’s a real showstopper. 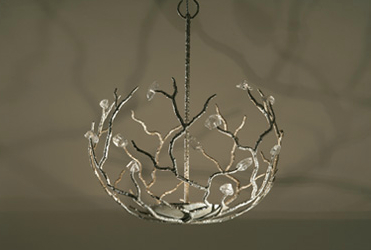 The naturalistic twisted vines in a soft silver and gold finish and topped with gorgeous crystals is like a piece of art. Similar to the Porta Romana fixture above, the Crystal Bud Sphere Lantern from Shades of Light is a more budget friendly choice, while still providing a show-stopping appeal. Historically, fanlights in bathrooms have been utilitarian, but not especially pretty. The Orleans fixture from Hunter is certainly both pretty to look at as well as functional and is UL approved for use in showers and over bathtubs. The white glass shade features an ornate cast Bronze finish detail with a removable finial for easy cleaning. Written by Linda Merrill for Homeworx.com. Reprinted with permission. Ciao Italia – The most bella man!